F.lux, a popular app for the Mac that allows users to adjust the color of their screen based on the time of day, yesterday expanded to iOS with a beta app, but as of today, the app is no longer available. Because iOS does not have the necessary documented APIs to allow f.lux to function, f.lux was skirting the App Store with private APIs and asking users to install its iOS app through Xcode, using a technique called side-loading. Apple has now informed f.lux that asking people to side-load apps onto their iOS devices violates the Developer Program Agreement, so f.lux can no longer be installed on iOS devices using Xcode. 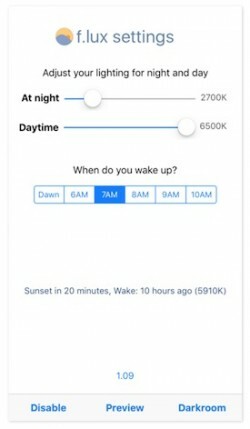 For those unfamiliar with f.lux, it's an app that adjusts the blue light of a screen based on the time of day to avoid interfering with the body's circadian rhythm. During the day, f.lux mimics natural daylight, but at as the sun sets, it cuts down on the amount of blue light and makes the screen more yellow, which is said to encourage better sleep. F.lux is a popular Mac app that's been downloaded 15 million times, but with side-loading no longer available, f.lux for iOS is non-existant. F.lux's developers are urging customers who want f.lux for iOS to send feedback to Apple, as the company would need new documented APIs to introduce the app through official channels. Godammit. Stop making me hate you, Apple. Hopefully the popularity of this sends a message to Apple and they'll add something similar in an upcoming iOS. This is the kind of low hanging fruit that can be picked off once a platform is mature. Or they could open source f.lux and Apple would be just fine with it! The way they were doing, tricking Xcode into copying a pre-compiled binary was shady, this was the obvious outcome. We need a true NIGHT MODE. All text becomes white, backgrounds become black, photos remain as they were. This is why I keep arguing that iOS isn't a true operating system in its current state, and in Apple's current mindset. On OSX, there's (hopefully) no fear of f.lux and other apps like it somehow not being allowed to run. It's because of times like this, I feel like switching to Android. Seriously Apple, it's called "side-loading" for a reason. You are not responsible for it. Quit acting like a baby! This. "Side loading" is (now) perfectly legal if you give the user (with a developer ID) an opportunity to inspect the source code before building the app and installing it on that users iOS device with Xcode from a Mac. Nobody cares because this is for tech users and not iOS users.